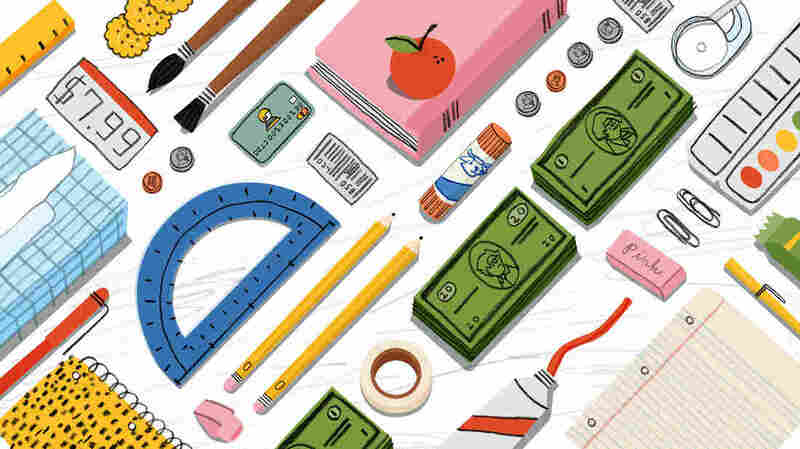 How Much Do Teachers Spend On Classroom Supplies? : NPR Ed Republicans have agreed to preserve a $250 tax break for teachers when they buy classroom supplies. But teachers tell us that they typically spend a lot more. It's inevitable. Each year, teachers dip into their own pockets to buy things like notebooks, tissues and pencils for their students. This inevitability is even enshrined in the tax code, which gives educators a $250 deduction for their trouble. Late last week, in hammering out their big tax overhaul, Republicans decided to preserve that deduction. So we thought we would ask teachers how much of their own money they spend each year. The answer: more than $250. Erin Craddock, a fourth-grade teacher in Virginia, says she spends more than $300 a year on things like chapter books, bookshelves, folders, organization trays, pocket charts, construction paper and hand sanitizer. Many teachers told us they spend as much as a $1,000 a year, including Heather Lyke. In an average year: around $1000 (professional development books, office supplies, tissues, art supplies, snacks for students who don't have food at home, etc.). Also, the more impoverished your student population, the more you spend. Steve Peterson, a retired fifth-grade teacher in Iowa, taught for more than 20 years and spent as much as $1,000 a year. "As a drama educator, I spend at least $600 on supplies, props and scripts," says Becky Solomon, a high school drama teacher in Chicago. This is an obvious but important point: How much a teacher spends depends a lot on what and whom they teach. Kindergarten classrooms, for example, require an inexhaustible supply of crayons and hand sanitizer, while a high school biology teacher may max the deduction with one order of leopard frogs. Gregg Rutter teaches math and advanced English and runs an elementary-level STEAM (science, technology, engineering, art and math) lab in Minnesota, and he says he spends about $2,000 a year on books and project supplies, including robots and other high-tech equipment. No matter the class, though, teachers in high-poverty schools often find themselves digging even deeper into their own pockets — to buy extra food for their students, as Lyke mentioned, and clothing. The Treasury Department estimates that in tax year 2016, the classroom expense deduction cost the federal government roughly $210 million in tax revenue. In a survey by Scholastic, an educational publishing and media company, principals were found to have spent an average of $683 of their own money, while teachers spent $530 — and teachers in high-poverty schools spent nearly 40 percent more than that. Extras- notebooks, pencils, glue sticks, folders, etc. Students have lists but if a student can’t afford, they need to have supplies. And those run out in the school year. Sometimes parents or community will donate extras but not always. Rachel Fielhauer, a fifth-grade teacher in Ohio, says she spends as much as $1,000 a year on her students. Sometimes parents help defray the cost by donating supplies, she says, but it's often not enough. And Fielhauer insists she would keep spending, even without the $250 deduction. "The tax write-off is nice to acknowledge what educators spend," she says, "but I will keep spending as it is what my students need."